students deepen their understanding of the food system and develop their skills as leaders, food advocates and community members. 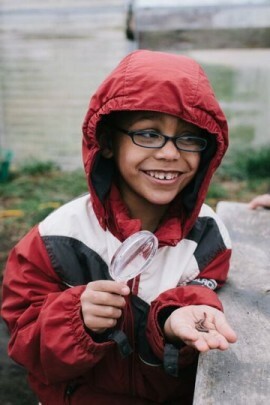 Each discipline is a lens through which the students are encouraged to explore the food system. In biology, they study genetic modification, plant breeding and issues of seed sovereignty. In history, they follow the paths people (and food) migrated across the seas - from the Age of Exploration through the Industrial Revolution - researching the ways in which food dramatically and suddenly transformed our ecosystems, cultural identities, and global economic systems. In health, students are empowered to make change by creating their own food rules, after analyzing the impacts of our individual food choices. Throughout the year, students are encouraged to participate in service learning projects in the garden and on local farms, connecting to the island community directly by working the land and supporting our local food system. How does history inform our food choices? How do our food choices affect our communities? Why is it important to know where our food comes from? What does it mean to "Vote with your Fork?" How can we make healthy eating choices? What role does food play in our identity? How has our food system changed over time? How can we make change through our food system? (3)	mutations	caused	by environmental	factors.